Airplanes and Rocket website visitor Michael M. requested that I scan and post this article from the May 1970 American Aircraft Modeler. The Escondido Mosquito is a tiny rubber-powered free flight model with a wingspan of just under 8". Per designer Bill Hannan, "The silly little thing is great for the living room or office." This silly little thing is great for living room or office. You can build it in one hour. This simple model, if correctly constructed, can be made to perform in the average-size living room or office. It makes a fine conversation piece that will capture the attention of even non-aviation-minded visitors. The design is intended to be rugged enough to withstand the rigors of bouncing off walls and furniture that inevitably occurs when flying in restricted spaces. While the duration cannot be expected to compare with "serious" indoor models, it is quite possible to achieve several laps of the room, and contests between two or more of these tiny terrors are great fun! Models of this general type have been popular for many years, and in fact, some of the earliest published plans were for flyers of this breed. Of the variety of interesting names which have been bestowed upon them, such as "Parlor Pursuits," "Midgets," etc., the name that seems to have turned up most frequently is "mosquito" or variations thereof. 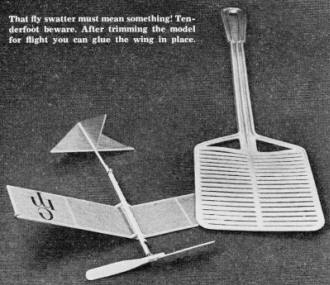 For example, an advertisement appeared in the Dec., 1910 issue of Aeronautics magazine, which offered for sale a tiny machine called the "Jersey Skeeter." 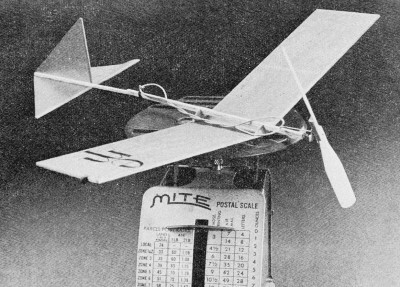 During the late 20's, a small model named the "Baby Mosquito Flyer" was marketed by a firm called the "Mosquito Flyer Co."
There is no easier way to make a balsa prop; just be sure the hole is centered and true. Our little "Escondido Mosquito" carries on this long established tradition of balsa wood insects. "Escondido" is a Spanish word meaning "hidden," however, it is also the name of the small city in California where the author resides. Construction: Although the model is constructed in a straightforward manner, it is important to work carefully and to bear in mind that the lighter your mosquito, the greater its duration. Since the plans are full size, you will be able to work directly over them, using a piece of waxed paper or clear plastic food wrap to protect the drawings from glue. Wing: Select a light and straight piece of 1/16" sq. strip balsa. Usually, a search through a number of 1/16" sq. strips will reveal a few which are slightly undersize, and that size would be a good choice for this job. Additionally, the strip can be lightly sanded on all four sides to reduce the weight and remove the little hair-like fibers that may be present. The trick is to sand in one direction only, to avoid buckling the strip. Pin down the parts to the plan using straight pins. 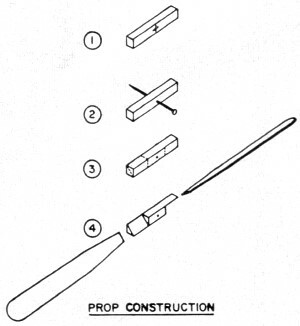 Do not pierce the wood, but rather angle the straight pins on both sides of each strip to hold it in place. Only a small amount of glue is needed at each joint. When the wing structure has dried, cut the leading and trailing edges in the exact center, in order to allow one tip to be raised for dihedral purposes. This tip should be raised 1 3/4" above the building surface, and supported with a suitable block. Cover the wings on the top side only, using the lightest grade of tissue paper that you can obtain. Condenser paper is a good choice, since it is very thin and non-porous, but superfine Japanese tissue can be used instead. Do not shrink or dope the covering, since this might cause warping. Wing mounts: Cut the wing mounts to shape from fairly hard 1/32" sheet balsa. Note that the two mounts are different, to provide for an angle of incidence. These mounts also help to strengthen the wing dihedral joint. 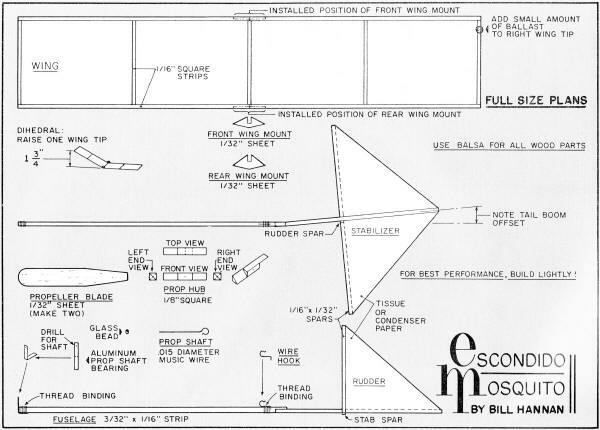 Fuselage: Select a light but stiff section of 3/32 x 1/16" balsa for the fuselage. It is important that the material be rigid enough to resist "bowing" under the strain of a fully wound motor. Sand lightly, and notch for the 1/16" -sq. tail boom. Note that the tail boom is offset, as shown on the plan top view, to enable the model to fly in small circles. Glue this joint sparingly, since the angle may need to be slightly altered to suit your particular flying space limitations. Metal parts: The propeller shaft and rubber motor rear hook are bent to shape using needle-nose pliers. Music wire of approximately .015 diameter will work well. The prop shaft bearing is made from aluminum or dural sheet stock, which is drilled to accept the prop shaft, then bent as indicated on the drawing. Roughen the portion of the aluminum where it contacts the fuselage, and glue in place. A few turns of sewing thread will greatly strengthen the joint. Glue and bind the rear wire hook in similar fashion. Tailplanes: Glue the 1/16 x 1/32 x 3 1/4" balsa stabilizer leading edge onto a sheet of tissue paper. Allow a few moments for the adhesive to set, then trim the tissue to the triangular shape shown on the plan. This is easier than trying to glue the stick onto an already cut triangle of tissue. The rudder is constructed in the same way. Glue the stab onto the lower side of the tail boom, using the plan top view as an alignment aid. Next, glue the rudder to the side of the tail boom. Propeller: The prop hub is made from a medium-weight piece of 1/8" - sq. balsa strip. After cutting to length, mark the exact center of the hub, and carefully push a thin straight pin through it. Do this slowly, and try to keep the pin properly centered as viewed from the end and side of the hub, so that the finished prop will not wobble. Next, measure and mark off the portions of the hub which will be cut away to receive the prop blades. A diagonal line should be drawn on each end of the hub to serve as a guide for the depth and direction of each cut. It is safer to cut the wood away a little at a time, rather than trying to re­move the entire corner at once. The blades themselves are cut from 1/32" sheet balsa. Using a paper pattern as a template, make the two blades as nearly alike as possible, then carefully sand and slightly round the edges. When gluing the blades onto the hub, be sure to check that they are properly centered. After the glue has dried, place a thin wire through the prop-shaft hole, and check the propeller balance. One blade will probably swing to the bottom, indicating the need to be lightened. A little sanding should take care of the problem, and while absolute perfection is not required, the better the balance, the smoother will be the flights. Slide the prop shaft through the fuselage shaft bearing, and add a glass "seed bead" for a thrust bearing. After inserting the shaft into the prop hub, bend the end of the shaft into a "U," using needle-nose pliers, and force the "U" into the front of the prop hub. Apply a film of glue over the area to keep the shaft in a secure position. A tiny drop of oil applied to the shaft will help reduce friction. The wing may now be installed. The mounts should be a fairly snug fit on the fuselage, which will hold the wing in place, and yet permit wing shifts for balance purposes. Power: This model requires only a very tiny amount of power, and in fact, too much power should be avoided. The exact power required will depend upon the weight of the finished model, but here are some suggestions for a start. If 1/24" - sq. rubber is available in your area hobby dealer's shop, give that a try. A single strand of it may prove adequate. Simply tie a loop in each end of the strand, or if you prefer, the loop at each end may be secured with a couple of turns of sewing thread. Be sure to trim the loose ends of the rubber so that they will not rub against the fuselage, which wastes power. Or, try a single strand cut from a common office-type rubber band. These vary widely in size and quality, so some experimenting will be needed. Another possibility is to slice your own thin rubber strand from a wider piece, using a sharp razor blade and a straight edge. If your model turns out to be very light, you may wish to investigate the use of elastic shirring thread. This is the type of elastic used in the tops of socks, shorts, and similar wearing apparel. Again, size and quality varies from brand to brand, so do a little looking around. In the case of the tiny sizes of this substance, a single loop (two strands) may be needed to provide the right power. Flying: After you have installed the rubber motor, try a gentle hand glide. Shift the wing slightly forward or rearward as required to achieve a gentle descent. Next, try a few turns of the prop, and launch again. If all goes well, try a few more winds and repeat. We prefer to fly our mosquitoes in quite small right-hand circles. In order to achieve this (assuming no warps), it may be necessary to add a small amount of ballast to the right wing tip. Although modeling clay is the accepted ballast material, it has a disadvantage, in that dropped pieces may become imbedded in the rug and cause stains. Needless to say, this does not go over too well with the lady of the house. As an alternative, try an artist's kneaded eraser, or typewriter cleaning dough. This material can be handled about like clay, but it will not stain rugs, etc., since it is non-greasy. Remember to launch the model gently, with the propeller turning. It may also help to release the model in a slight right bank to give it a hint of what it is expected to do. If your flying area is fairly large, you may be able to fly in large diameter circles without needing wing tip ballast. On the other hand, if your flying site is unusually small, it may be necessary to offset the rudder still farther, and add additional wing-tip ballast. All of this can be determined during testing. If the model should happen to crash, the damage can be easily and quickly repaired. Remember, however, that the added weight of the glue required for repairs may bring about the need for re-trimming of the model. With a little practice, you should find it quite easy to launch the model, watch it make several laps of the room, and have it return to your hand. 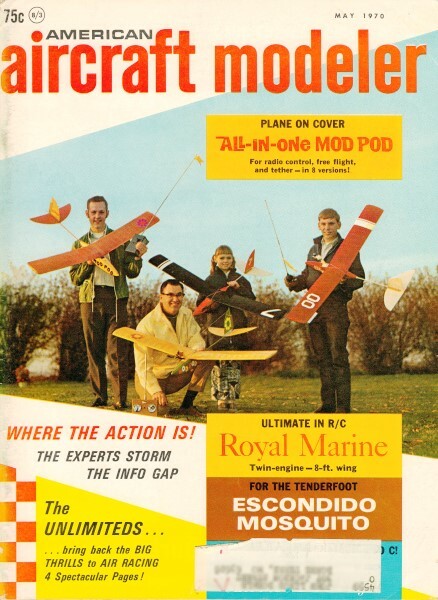 This may be the answer for the fellows who like free flight, but don't want to chase models! 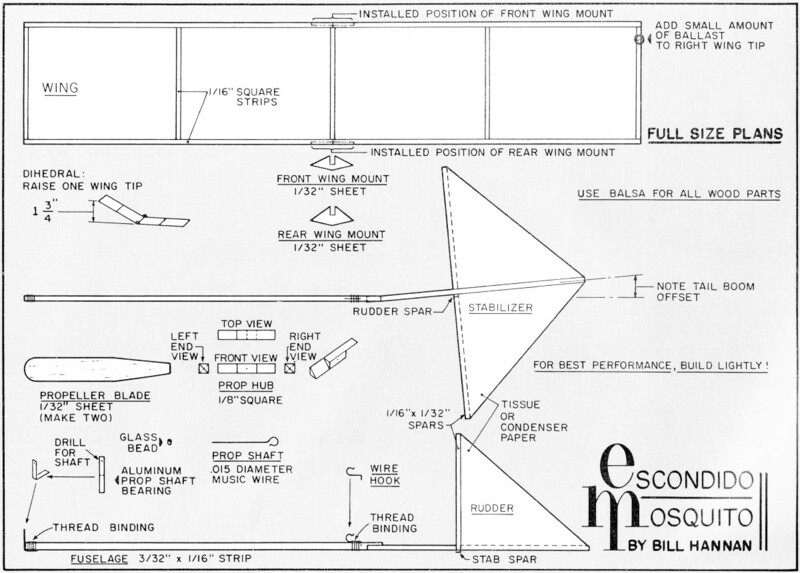 1 small piece of 1/16" sheet: fuselage; OR, 1 strip of balsa 1/8 x 1/16", cut down to 3/32 x 1/16"
Escondido Mosquito Plans - Wingspan = 7-15/16"